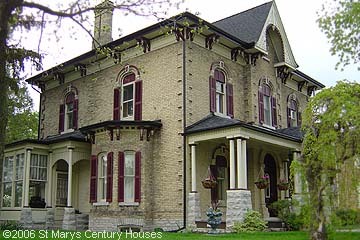 This italiate style house was built about 1875 for Hatty and Clarence Freeman by the London, Ontario firm of James Robinson. Hatty was the daughter of grain merchant George Carter (#224 Jones St) and Freeman was made secretary/treasure of Carter's firm. This tudor revival house was built in 1914 by the London, Ontario firm of Watt and Blackwell. 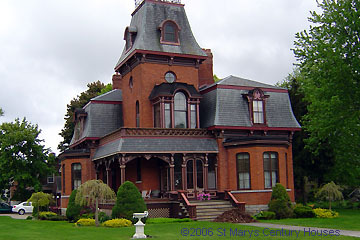 Built in 1869 for George Carter. Carter established his grain business in St Marys in 1857 and later opened branches in Stratford, Mitchell, Granton and Ailsa Craig. In 1884 bought the St Marys Mill. He died in 1889. George Carter gave this Second Empire style house as a wedding present to his daughter Charlotte. Son-in-law Henry Lincoln Rice son of the Methodist minister became vice-president of Carter's firm. St Marys physician and public speaker Thomas Sparks moved to the house in 1905. He named it Ercildoune after his birthplace in Scotland. 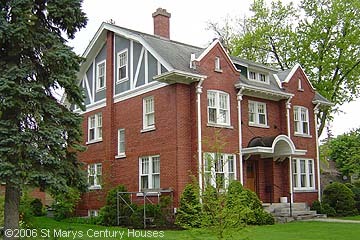 When Dr. Sparks first moved to St Marys in the early 1890'she lived at 322 Emily St.